What would fly fishing be like without fly lines? Indeed, fly lines are everything when it comes to fly fishing. Unlike in spin fishing, it is the fly lines weight that allows the angler to cast the fly - not the weight of lure as with spin fishing. 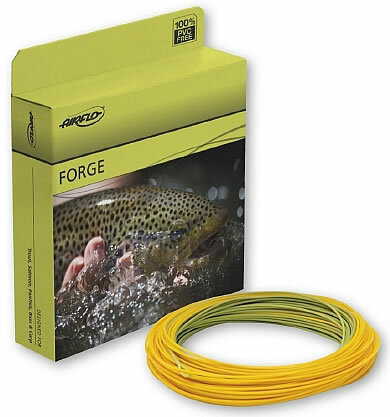 An AirFlo Weight-Forward Floating Line for Trout. See more floating trout lines at Amazon. Worse, an angler who uses the wrong type of line will have significant difficulty simply casting, while chasing away all the fish for miles around in the process. Since fly lines are often a confusing and tricky subject, to help new anglers who don't have a clue about fly lines I've prepared this guide. This multi-page article is dense and rather lengthy, so my apologies in advance. If you want to skip the reading and just get the basics about fly lines, I've summarized the basics on the bottom of this page. Click to view other articles in the Big Sky Fishing gear guide series that explore the world of fly fishing gear. Fly lines, unlike many items used for fly fishing, aren't generally considered a "personal taste" item. This, to a degree, makes shopping for fly lines pretty simple once you have figured out all the technical details. If you already have a fly rod and fly reel, determine what the fly rod weight and fly reel weight is. Then look only for fly lines that have an identical weight. Fly Rod Weight = Fly Reel Weight = Fly Line Weight. Decide what type of taper you want the fly line to be. For most fly fishing, the weight-forward (WF) taper is the fly line of choice. And for trout fishing, WF taper should be the first fly line any angler buys. Decide which color of fly line will be easiest for you to see in a wide variety of daytime lighting conditions. Once you have that settled, go shopping. Good grands of fly lines include those from Cabela's, Orvis, Scientific Angler, RIO, Fenwick & Cortland. One common question new anglers face when buying fly line is whether or not they need a second fly line. Particularly, new anglers often wonder if in addition to a weight-forward floating fly line (best for trout fishing), they should also purchase a sink-tip fly line (for deep nymph fishing or perhaps bass fishing). My suggestion to new anglers is to hold-off on purchasing a second line. The simple addition of a few weights on the leader can turn a floating fly line into a multi-functional piece of equipment. A sink-tip fly line is really only needed if you very frequently fish "down deep" and find that weights on the leader either don't provide the depth needed or bring it down deep quickly enough. Again, for trout fishing, stick with a weight-forward floating line. It will likely be the only fly line you'll ever need. Offline, any fly fishing shop should carry a multitude of fly lines. Just note that a fly fishing shop that specializes in gear for Salmon may have a skinny selection of fly lines for trout. Fly Lines at Amazon - Probably has the largest selection of fly line available. Fly Line Density - The Density of a Fly Line is whether the fly line floats, sinks, or partially sinks. Fly Line Taper - Fly Line Taper refers to changes made to the fly line itself that allow for better casting. The most popular, and most versatile, is the Weight-Forward Taper. Fly Line Weight - Fly line weight is the weight of the fly line, measured in grains, and helpfully given a number from 1-14 by the fly line manufacturers. To choose the right fly line weight, first figure out what you will be fishing for. Then, make sure that whatever fly line weight you choose matches - exactly - the fly rod weight and the fly reel weight that you plan to use. Fly Line Color - The color of the fly line, if topwater fishing, is of no consequence. The fish can see the shadow of any fly line during daylight hours. Thus, get a fly line that is easy for you to see, with orange, yellow and red probably being the most popular colors. For submerged fishing, generally you want to choose a darker color, with various shades of brown/black being the most popular and effective. Trout Fishig & Fly Line - For trout fishing, a floating fly line is by far the most popular and versatile. If you are fishing submerged nymphs, just put tiny weights on the leader. By and large, most trout fishing is done with a floating fly line. Understanding Fly Line Codes - The codes on a box of fly line can be a bit daunting. Here's an example of a typical fly line code : WF-4-F. What this means is that the fly line has a Weight Forward Taper, a Fly Line Weight of 4, and Floats. Thus, to understand fly line codes, the first series of letters/numbers first is the taper, the second series of letters/numbers refers to the fly line weight, and the third series of letters/numbers refers to the density of the fly line (whether it sinks or floats). The Big Sky Fishing gear guide explores the dark and murky world of fly fishing gear.